It's been a right old busy week this week! We did a super-fun but very tiring buying trip on Friday and I can't wait to show you the fantastic goodies we brought back. As usual though, you'll have to wait until next week to see them, when everything is cleaned up and presentable. This is another of the maxis which is now in stock, and it's one of my personal faves. 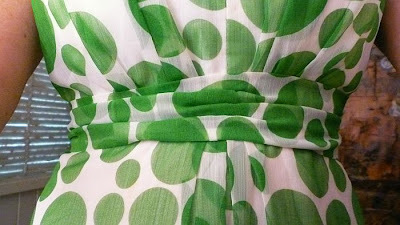 Late 60s, silk georgette, fully lined, green, and polka dot...what's not to love? 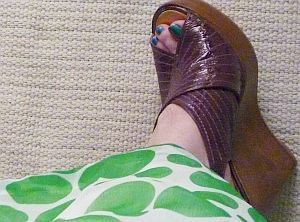 Purple platforms and blue toes make the outfit just right, a bit of pop without being over the top. Whats your Friday frock this week? Have you shown us yet?? What? I'm the first commenter? Hurrah! Girl I love that fierce face in the first pic- super model Kitty! And the frock rocks. Love that big bold and happy granny smith apple green polka dots. They just make me happy. Can I dress my mannequin to my frock she has no muffin top....love your frock! My dear Kitty I love it all. Of course purple and green should always be seen. Personal I think every colour goes with green. I love everything about the dress, it's my fav colour. 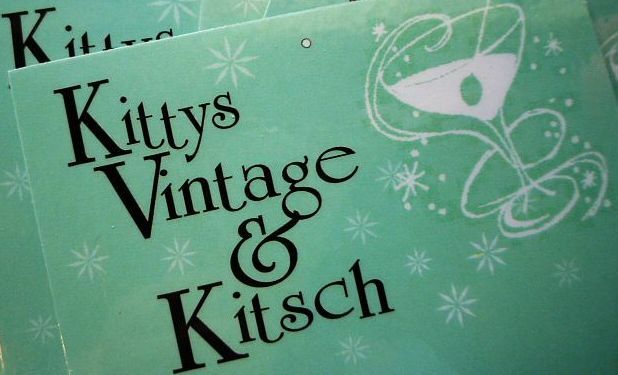 I am SO in awe of how amazing you look in every post, Kitty! Another wonderful frock, it suits you so well and the shoes and toes just rock it up a smidge! 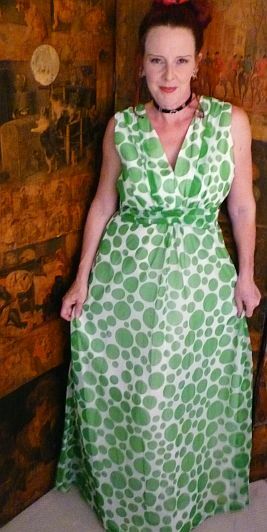 bella spotty green maxi dress. I would of been tempted to keep all the frocks for me.